Dove is such a good brand and it’s also one of my favorites! I’m still a huge fan from the derma spa line, cashmere comfort. And dove has something new now! Namely, the nourishing secrets line! I was so excited to try the products out! So today I’m going to tell you more about the shampoo and the conditioner from this very promising line! The dove nourishing secrets is a product line where women from all over the world share there beauty secrets. There are five different lines inspired by beauty rituals from women from India, Japan, France, Central-America and Africa. The line that I’m going to tell you more about is inspired by the strong hair from the American women. There secret is avocado-oil and calendula. Avocado is perfect to make the hair stronger and the fatty acids from calendula are perfect to repair the hair! Sounds very promising! This shampoo is meant to make your hair stronger and to give a boots to thin and damaged hair. Back in the days I had so much hair with volume and now it’s getting thinner and thinner… So this shampoo is perfect for my hair type! And like dove promised I saw much difference after one time using it! First of all I really love this shampoo! It smells so good, it’s a delicious, soft smell! But except the good smell it also makes my hair very soft! And now after a few times using it I’m convinced that this shampoo is fantastic! It makes my hair light and with some extra volume in! My hair looks much better and more groomed. But this is thanks too the combination from the shampoo with the conditioner. So let’s tell you more about it! I’m a huge fan from conditioner because otherwise my hair is difficult to tame. 😉 But just as the shampoo smells this one great! I let my conditioner absorb for a minute or two. When I was washing it out I directly felt that my hair was even softer than before. It’s for sure a good conditioner that doesn’t make my hair feel heavy, it still looks light and healthy. My hair also looks a bit bigger with more volume and I like that! Also it’s again more shiny and it doesn’t look as dead as before! 😉 So yes these products does give your hair a fantastic boost! Of course you don’t have to expect miracles. But it’s for sure a fantastic line that makes your hair healthy looking again! For sure a must when you have thin or damaged hair! Your hair will get the boots that it need! Also the products smells so good! 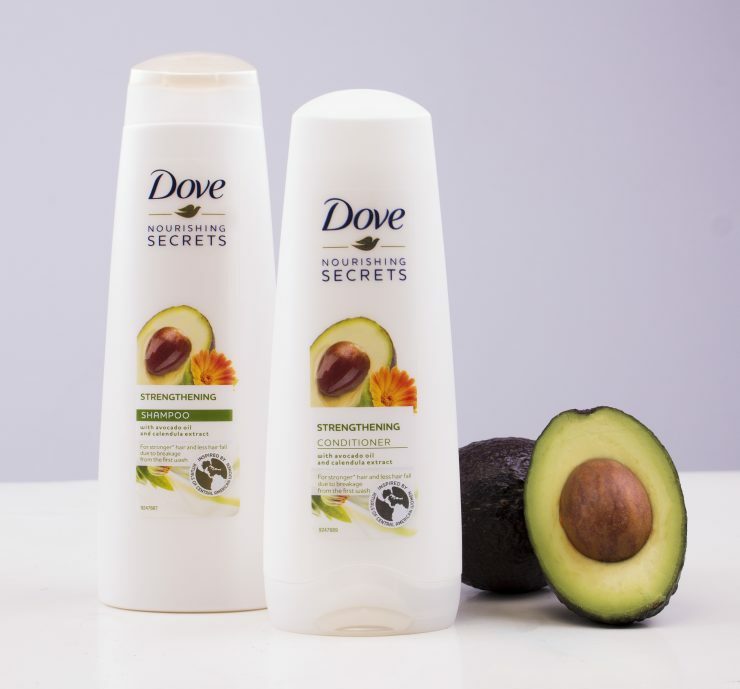 And if you are an avocado lover you will love this line! The conditioner contains 200ml and the shampoo 250ml. The price is €3,95 and you can find them in the drugstore. Ja ik vind ze echt top! Klinkt als een super fijne lijn! Ik heb vrij dun en krullend haar en met dit weer heeft mijn haar extra goede verzorging nodig. Dan zijn deze zeker en vast fijn voor jouw! Budget proof! I love it already haha. Ben erg benieuwd hoe deze gaan uitpakken op mijn haar. Haha, daarin vol ik je helemaal! Hopelijk bevallen ze je even goed! Ik gebruik heel erg graag de producten van Dove! De shampoo zou ik met mijn dunne haren wel eens willen uitproberen. Moet je zeker eens uitproberen! Ze vind ik deze zeker de moeite! Oei, dat is minder… Hopelijk werkt deze vele beter voor jouw meid! Ja, hier een grote Dove fan. Ik zou deze shampoo wel willen proberen. Ik vind dit een van de fijnste betaalbare merken. Dove is inderdaad echt een top en betaalbaar merk! Ohh dit klinkt super goed! Ik houd heel erg van producten met avocado erin, heerlijk. Zalige producten, die wil ik echt wel testen. Dove heeft altijd goede producten en voor weinig geld. Klopt de producten van dove zijn altijd top en zeer budget proef! Thanks & dove vind ik echt een top merk! Heel leuk artikel over Dove. En de foto’s met daadwerkelijke avocado’s vind ik erg geslaagd. Dankjewel dat is leuk om te lezen!